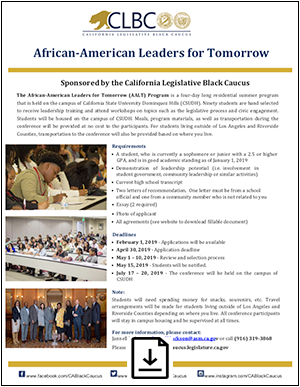 The African-American Leaders for Tomorrow (AALT) Program is a four-day long residential summer program that is held on the campus of California State University Dominquez Hills (CSUDH). Ninety students are hand selected to receive leadership training and attend workshops on topics such as the legislative process and civic engagement. Students will be housed on the campus of CSUDH. Meals, program materials, as well as transportation during the conference will be provided at no cost to the participants. For students living outside of Los Angeles & Riverside Counties, transportation to the conference will also be provided based on where you live. A student, who is currently a sophomore or junior and is in good academic standing as of January 1, 2019. Demonstration of leadership potential (i.e. involvement in student government, community leadership or similar activities). Essay One: Leadership: Discuss your leadership ability and potential. Include an explanation of why you feel you are qualified to participate in the conference. Also, discuss your expectations of how this conference will enhance your leadership ability and potential as well as support you in reaching your educational goals. Essay Two: Personal Statement: Write a descriptive piece about goals, achievements, or obstacles you have encountered in your academic life. Explain why attending college is important to you. You can also write about your preferred colleges, area of study you would like to focus on or even about your career aspirations. Note - Documents must be submitted in PDF. Photo in JPG/PNG. Special characters in file names, like apostrophes, will cause an error on submission of the form. Please combine all documents into a single compressed file (ZIP) or PDF and upload once. February 1, 2019 - Applications will be available. May 1 – 10, 2019 - Review and Selection Process. May 15, 2019 - Students will be notified. July 17 – 20, 2019 - The conference will be held on the campus of CSUDH.